The new three-door Polo has been unveiled ahead of its public debut at the Frankfurt Motor Show this month. Drawing on the same clean, sharp lines adopted by the five-door model, the new Polo three-door features a more aggressive stance, with a pronounced kink in the window line just above a sharp crease running the length of the car. 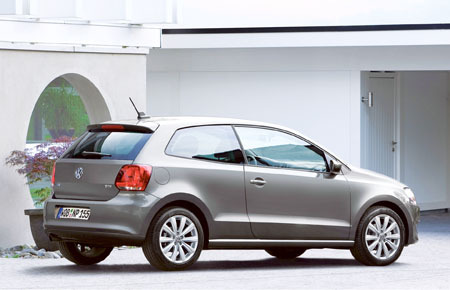 The overall effect is a cohesive, clutter-free design that makes the new Polo appear lower and wider than it really is. Built at Volkswagen’s facility in Spain, the three-door model will start production in right-hand drive form in late October before the first deliveries start in early 2010. Volkswagen say that every Polo is fitted with four airbags, ABS, ESP, and hydraulic brake assist as standard. In addition, the Polo comes with a CD stereo, speed sensitive power steering and electric windows. At launch, the new Polo three-door should be available with up to a choice of six engines, four petrol and two diesel. These are a pair of naturally-aspirated 1.2 litre engines with 60 or 70 bhp and a 1.4 litre 85 bhp; plus two 1.6-litre common rail TDI units producing 75 or 90 bhp. All engines comply with Euro V emissions legislation. A new 1.2 litre 105 bhp turbocharged TSI unit could also be offered.